In the corporate sector, approximately how many degrees should be there in the central angle ? What percentage of the total investment is coming from FII's and NRI's ? If the total investment other than by FII and corporate houses is Rs 335,000 then the investment by NRI's and Offshore funds will be (approximately) ? Investment other than NRI and corporate houses is 33% = 335000. Also, investment by offshore funds and NRI's is equal to 27%. If the total investment flows from FII's were to be doubled in the next year and the investment flows from all other sources had remained constant at their existing levels for this year, then what would be the proportion of FII investment in the total investment into India Bonds next year (in US $ millions) ? FII's currently account for 33 out of 100. 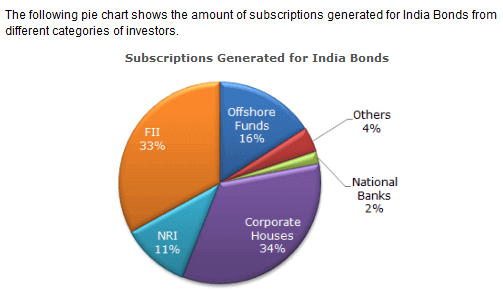 What is the approximate ratio of investment flows into India Bonds from NRI's to corporate houses ?